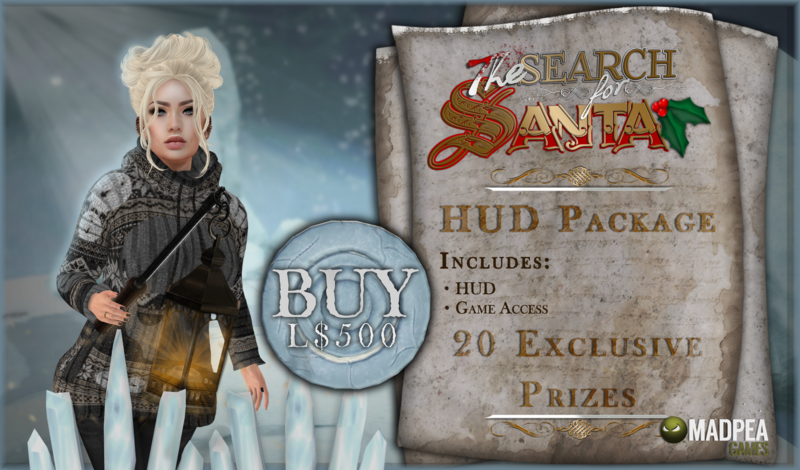 The Search for Santa is an interactive grid-wide hunt with some puzzle and story elements, running now until January 31st 2017! You are enrolled as a student of Social and Theological Anthropology at MadPea University. You have spent years studying people’s cultures, their religions, and more specifically their holiday traditions. It is during the course of these studies that you have become obsessed with the idea that Santa Claus is not simply a story parents tell their children to keep them well behaved. You are out to prove that Santa is real, and you just got a big break that may prove his existence once and for all. CAN YOU FIND THE TRUTH BEHIND THE MYTH? You need a HUD to play the game! To receive your game HUD. This grants you full game access and 20 exclusive prizes upon completion of the game. You can also purchase additional game enhancing items such as a metal detector to help you find the hunt items, an exclusive outfit made by MadPea, or a lantern to light your way! At MadPea Productions we offer many different types of games and experiences with various levels of difficulty and length. In order to better assist our players we have implemented a new rating system for our games so that you can get an idea of what to expect before you buy a HUD. When you first wear your HUD, you will be asked to accept the MadPea Experience Key. This allows the HUD to do things like teleport you without having to ask your permission each time. If the Experience Key fails, simply detach then reattach your HUD. Please note: if you have played any recent MadPea games, it will not ask you to accept the experience key. The HUD is simple to use! Some of the HUD elements shown will be unlocked during the course of game play. Carefully read the hints, if you need help you can always ask your fellow seekers in the MadPea in-world group! 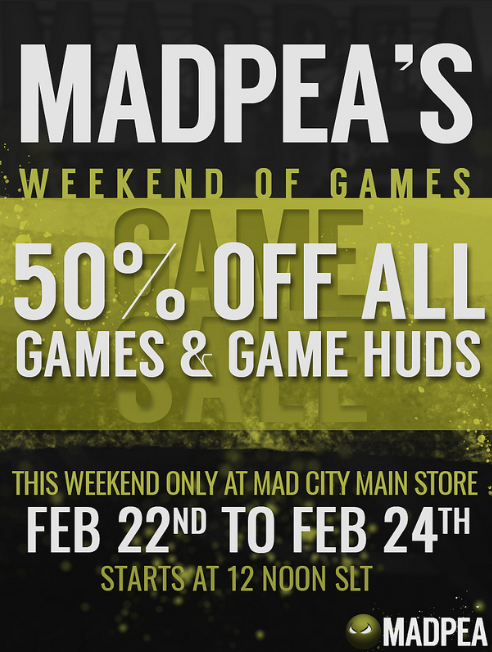 Leveling up at MadPea earns you exclusive prizes that you can claim in our main store. 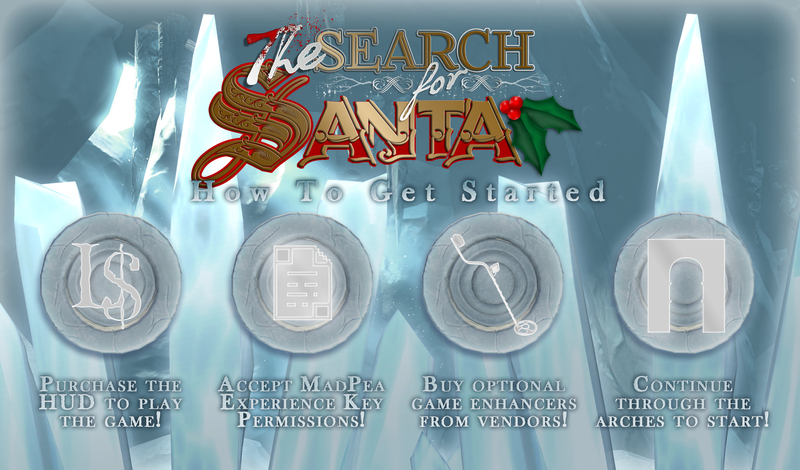 GOOD LUCK, SEEKERS OF SANTA! This game is filled with puzzles that are both easy to moderate to solve and suitable for all. Common sense and logic is required for solving the puzzles. The environments do not belong to MadPea Productions. They belong to the respective vendors. Thus, do not grief their customers, visitors, members or residents. Do not break their posted rules. 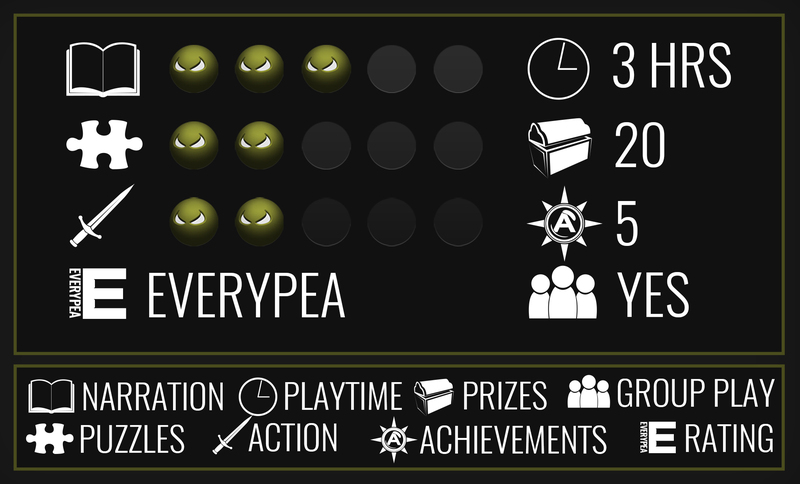 When you are playing, we would really appreciate if you wore the MadPea Group Tag. We are aware that Second Life has its own issues that we can not control, such as location logouts, reboots, or lagging and crashing. We have conducted several pre-game walkthroughs to make sure the game runs smoothly where it should, but we cannot guarantee that there will be no issues during the game. Should anything happen beyond our control that disrupts or halts the game, we will announce it via group notice at the first possible opportunity,providing further instructions relevant to the issue. Do not harass other players, do not instigate conflicts, and if you get stuck, do not whine and complain in group chat. Doing any of these actions will result in your revocation of your chat rights. You are allowed to communicate in group chat and help each other out. You are however NOT allowed to give out direct answers, spoilers and slurls. 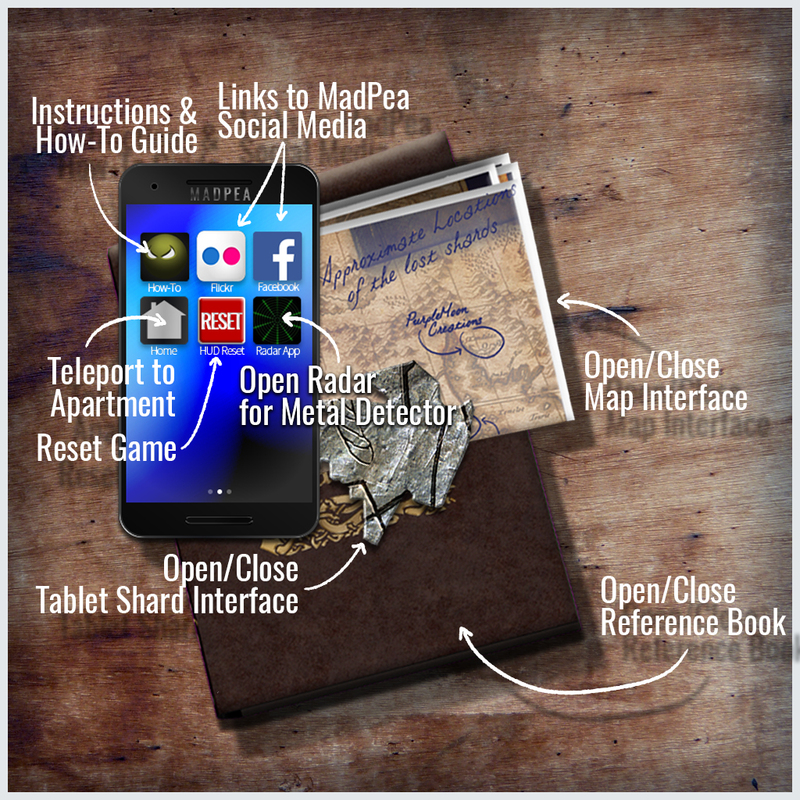 Everyone will receive 20 exclusive prizes as stated here upon completion of the game. MadPea is not responsible if you get yourself banned from a store/region and are not able to complete the game. Please check the list of the participating stores before you play the game to make sure that this is not an issue. If you are banned, you must resolve the issue with the sim/store owner. Sale! Sale! Sale! Games! Games! Games! 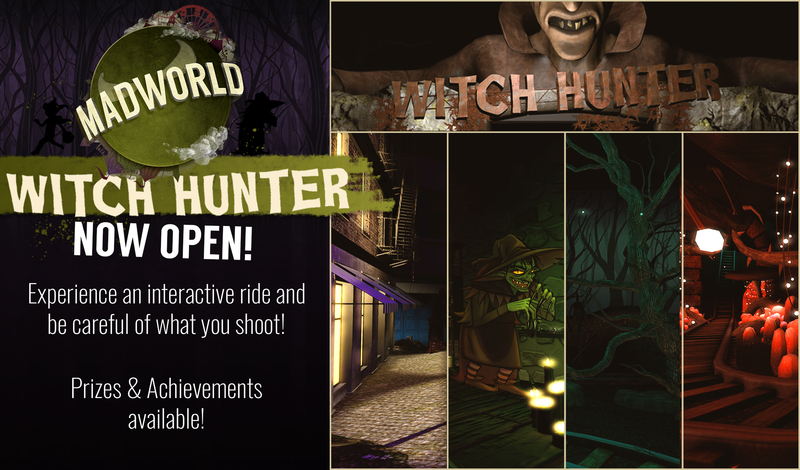 Witch Hunter @ Mad World! MadPea’s Halloween Monster Hunt is coming Soon!